Do 57% of UK cyclists jump red lights? 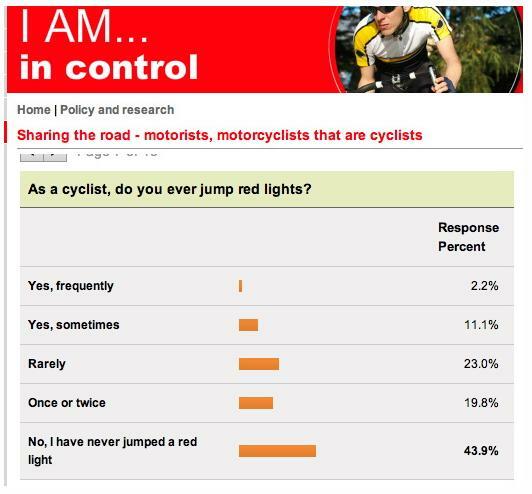 One motoring organisation claims so – on very flimsy evidence"
"57% of cyclists 'jump red lights'"
The IAM claim on their website that this figure comes from an online poll conducted with 1600 participants. However, as the Guardian points out, this was simply a self-selecting sample of visitors to the website who chose to participate in a poll via the Survey Monkey online tool. If this is indeed the case, that means that not only could any visitor to the website - cyclist or otherwise - have influenced the headline result, but also there would have been no weighting to account for participant attributes such as age, gender or location. Full Fact got in touch with the IAM for their own take on this criticism and we are waiting for a response. This suggests that rather than referring specifically to those that 'frequently' ignore red lights, the 57 per cent used in the headline actually refers to all those who have ever confessed to jumping a red. In fact, around 2 per cent "frequently" jump red lights and around 11 per cent "sometimes" do so. "Right. So not only is an unscientific, self-selected survey being presented as a poll, the headline figure is utterly misleading. And yet that's what will doubtless be reported tomorrow." We look forward to the IAM providing us with further details about the poll, and while it would be disappointing to see poll findings misrepresented in this way if the Guardian's concerns prove well-founded, it is nevertheless pleasing to see the paper thoroughly investigate the basis of a press release before it gets into print. Now the Daily Mail and [yesterday] the Times have picked up on the IAM press release via the Press Association and ran stories about its findings. The Times report avoided emphasising the 57 per cent figure and opted to focus on the reasons given by the 2 per cent who admitted to 'regularly' breaching red lights. It did, however, go on to cite the criticism the poll had received from, among others, the CTC cycling charity. "More than half of cyclists have jumped red lights to get ahead of other road users"
As a cyclist, do you ever jump red lights? Red lights shouldn't apply to cyclists. It's simply not possible to cycle safely and obey red lights. But the Daily mail still can't report science. No surprises there! Was also picked up and reported by BBC Breakfast on one morning this week with a representative of the AIM and a cycling rep.